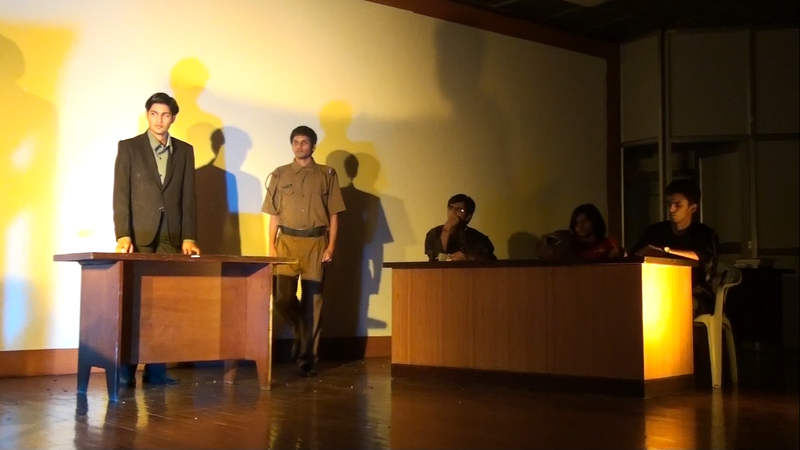 Based on a fight over a controversial case, this play had a very nice content. Informations to be given were nicely spread/scripted over the whole plot. Play had 2 lawyers against each other on a suicide which was very smartly framed. The story is quite simple though. A rich girl is kidnapped by some unknown kidnappers who later on force her father to commit suicide if he wants his daughter to be safe. Poor father without thinking or consulting someone else simply commits suicide (which was bit surprising for me). And there is a charge of murder on his business partner for kidnapping his daughter and forcing him to suicide because of company shares. Later on, it eventually comes that his daughter kidnapped herself with the help of her father’s business partner. And due to the lack of facts his business partner is set free by court. Charm of the play was the plot of the court-room. It was very nicely scripted and arguments from both the parts were quite strong. Having Bala on lights means you need not worry about it any more. Lights were good. Play used some nice and interesting background scores. Death and after death scenes were symbolically depicted by the evil of life, which was unique. All the actors were good. One of the lawyers’ kept fumbling with his lines, though carried out decently at the end. Play had a heavy prod. which was creating problems for the light set-up. The office of the father was made in the right quadrant of the stage to avoid unnecessary black outs. The play got nice appreciation from the audience. Overall a nice play to watch and good entertainment for the audience.